Although they're better known for exploring the avant-garde side of music nowadays in their Kkoagulaa format, Norway's Manes started life as a black metal outfit, and a good one at that. 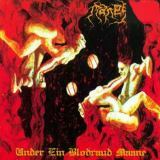 Releasing just three full-length albums in their existence, Under Ein Blodraud Maane (you'll never guess the meaning...) was the debut and the closest to traditional black metal. Looking back, 1999 was an interesting year for the genre, also seeing such boundary-shifting classics as Emperor's IX Equilibrium, Satyricon's Rebel Extravaganza, and Dødheimsgard's 666 International - the times, they were a changin'. Yet Manes created an album that could have come several years earlier, so traditional were the ingredients of blasting, shrieking, riffs and synths. The atmosphere hits like a punch to the face from the opening seconds of Min Trone Står Til Evig Tid, uncanny vocal gasps and snarls switching suddenly to a keyboard-backed black metal rumble, raw and heavy with distant black metal shrieks atop an unsteady concoction of programmed drums, skeletal guitar riffs, and church organs that seizes on a Burzumic melody and holds it before slipping back into blasting, sounding like a less sane version of early Dimmu Borgir as well as having a lot of influence from the infamous Count. Despite the band's musical youth, their latent desire to experiment is soon apparent. Keyboards move from orchestral flourishes to neoclassical piano tinkles, and already the band are trying to outdo the technology available to them with very artificial-sounding war drums. That is a huge point against the album - if you don't like programmed drums, it's fair to say these will make you wince. Yet you should have patience, as tracks like Maanens Natt are worth waiting for, another Burzum-esque atmosphere changing into something akin to Limbonic Art with epic orchestral-backed riffs, a foray into eerie, almost whistling synth noises towards the end shows that Manes' usage of the keyboards is actually one of the best aspects of the album. The strange droning and distant voices that open Uten Liv Ligger Landet Øde are amazingly creepy, and the sudden bizarre switch to a kind of synth military march and resulting all-enveloping riffage truly shows off the talent here. Ending with a high-pitched, melancholic guitar solo, the soundscape that emerges is fantastic. As far as atmosphere goes, Under Ein Blodraud Maane more than delivers. Each song is different in various ways, the creeping De Mørke Makters Dyp more straightforward an assault with keyboard crashes and varying tempos as the reverberating guitars work their magic on your ears, beginning and ending with slow lashes of doom-laden atmosphere - yet is totally at odds with the more aggressive title track, the vocals becoming more desperate and screeching as the keyboards take the lead alongside the riffs, only for the tempo to subtly slow and the track become a doomy sludge through a land of horror. It's finale Til Kongens Grav De Døde Vandrer that I love the most, however, a backing mournful horn accentuating the shimmering riffage, all the instruments working together wonderfully to create a traditional black metal melange that still sends a shiver up your spine years later. Say what you like about the band's later material (I think that 2003's Vilosophe is deserving of reappraisal soon...) but it's impossible to deny the delightful gem that this album is. Rough around the edges, behind its time and a bit too reliant on influence from Burzum, sure, but Under Ein Blodraud Maane is a very enjoyable album and deserves the batlike ears of any black metal fan with an affinity for the genre's past.